Patterns are everywhere in nature. The natural patterns found in nature deeply affect and nurture us. They are imprinted in our physiological-cognitive system and when we spend time in environments devoid of natural patterns, it leads to anxiety and stress which in the short term hampers productivity but in the long term can lead to illness. Nikos Salingaros, architectural theorist and mathematician, emphasizes that there are enormous opportunities to create healing built environments by incorporating the mathematical qualities of those found in living and natural forms. There are many kinds of natural patterns and those that have a self-similarity are called fractals. According Salingaros, “much, if not all, of natural structure is fractal”. Fractals are patterns that repeat at different scales: If you zoom in on a picture of a fractal, you will still see the same pattern repeated. Examples of patterns found in nature. Richard Taylor, a physicist at the University of Oregon, and fractal fanatic, explains that “Your visual system is in some way hardwired to understand fractals,” said Taylor. “The stress-reduction is triggered by a physiological resonance that occurs when the fractal structure of the eye matches that of the fractal image being viewed.” When an environment veers away from natural patterns, it leads to some discomfort, even if subconsciously. Science has long studied the relationship between natural patterns and the human brain. As it turns out, the brain is a powerful pattern recognition machine. One study even called pattern processing “the essence of the evolved human brain,” noting that humans have recognized the central importance of SPP [superior pattern processing] for their advancement as a species.” In other words, being able to identify patterns is an inherent part of being a human. This instinct is so strong that we even tend to perceive patterns where there are none. Thus, it probably doesn’t come as a surprise that patterns have healing effects. Namely, patterns help to reduce stress. A 2006 study found that incorporating fractals into architecture results in lowered stress levels. Other research has shown that viewing fractals can reduce stress by as much as 60 percent. Another study found that surgical patients with rooms that featured views of nature spent less time in the hospital than patients whose rooms faced a brick wall. Patterns also have an undeniable visual appeal that’s immediately apparent to the viewer. This has a larger implication as well: that nature and its patterns are inherently beautiful. 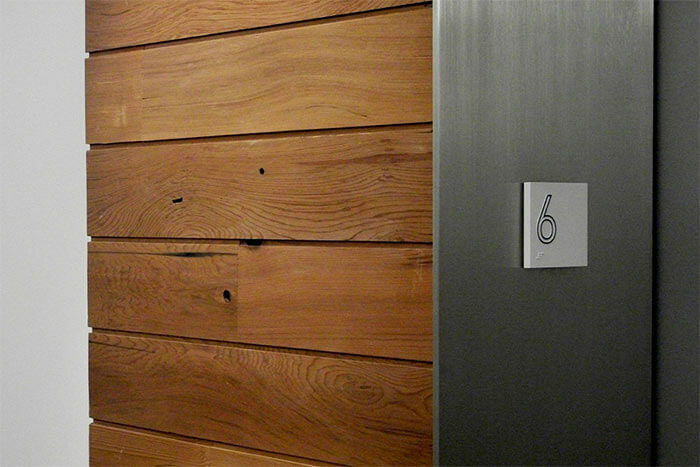 Indeed, people are drawn toward natural materials like wood in the built environment, as observed by A. Quincy Jones. The closer a constructed environment is to the natural world, the more enjoyable it will be, and patterns play a large role here. Salingaros, of strong opinion that the way we shape our buildings will shape us, feels minimalist spaces void of nature make us uneasy. We must bring nature and its patterns into design. 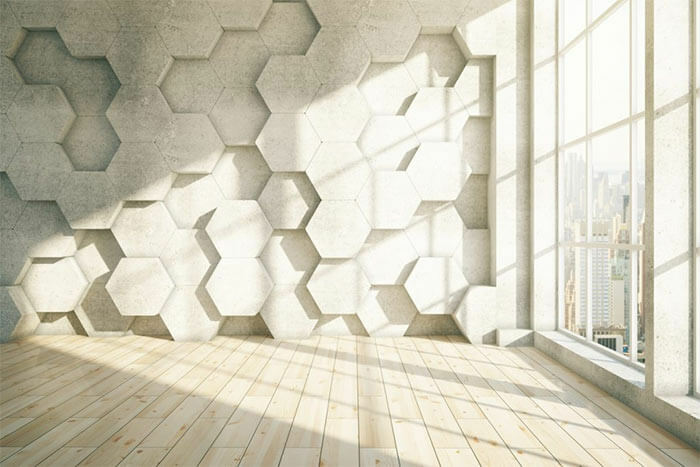 Designers can incorporate natural patterns into the built environment in many creative ways. People have an affinity for natural materials. Thus, to maximize the positive effect of pattern, it makes sense to use natural materials in the process. Materials can be the vehicle to provide pattern or the instrument to create them. Think wooden spiral staircase. The spiral shape is a reflection of nature and the wood, analogous of nature, provides its own natural patterns. The patterns present in wood are especially beautiful. 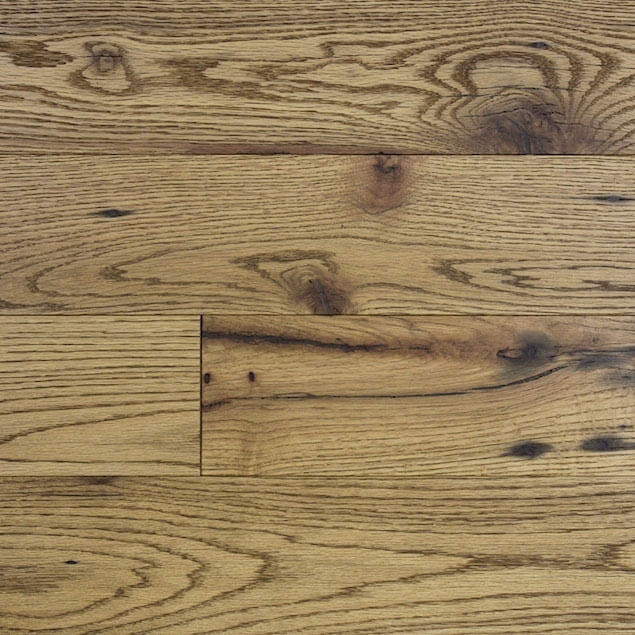 The size, type and arrangement of wood cells differ from one wood species to another, and this affects the appearance of the grain.Some wood species have very figured grain pattern while others are more refined, all of which can be presented differently depending on how the wood is sawn. 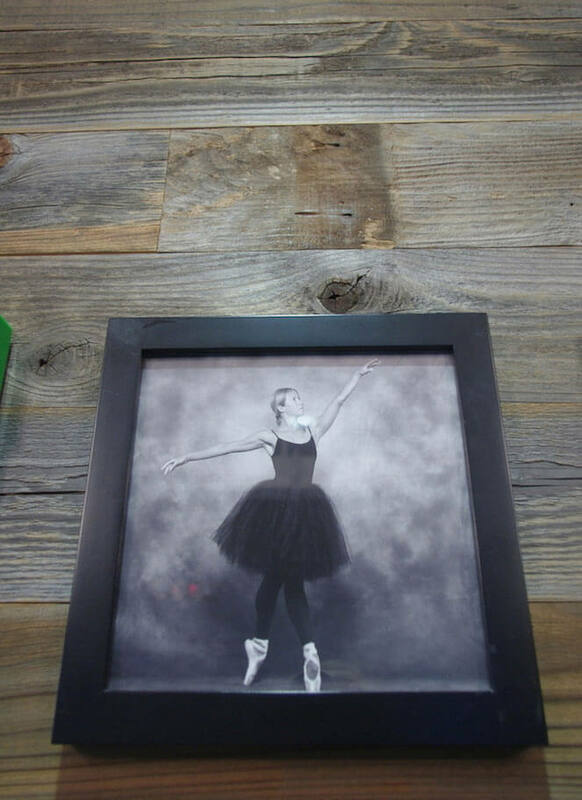 Reclaimed wood that has been weathered or naturally distressed over time adds another level of character that can enrich the patterns found in wood. Natural patterns are universally beautiful. When we view the patterns found in wood ––whether it’s a complex fractal or a simple series of cracks ––we perceive beauty. The numerous wellness benefits that patterns can provide present amazing design opportunities. This focus on patterns has been instrumental to the rise of biophilic design. 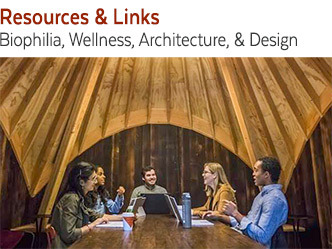 In the landmark report “14 Patterns of Biophilic Design,” Terrapin Bright Green put forth 14 central concepts that detailed the relationship between humans and biophilic architecture. One of those concepts is Biomorphic Forms & Patterns. A biomorphic pattern is simply a pattern found in nature or a pattern that simulates a natural pattern. 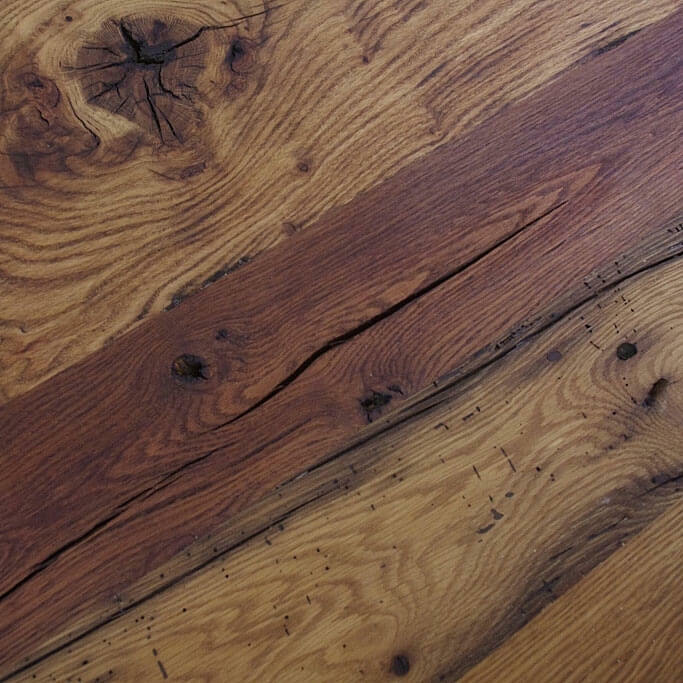 As Terrapin puts it, “The objective of Biomorphic Forms & Patterns is to provide representational design elements within the built environment that allow users to make connections to nature.” One of the best (and easiest) ways to make that happen is to use natural materials, which is why reclaimed wood is so useful. No matter the type of wood, the abundance of patterns will have a positive effect on the viewer. The patina and weathering marks present in post-consumer reclaimed wood accentuate the natural patterns and add character. Patterns make up a critical part of the natural world, and as humans, we’re meant to connect with these patterns on an innate, instinctive level. Knowing how beneficial patterns are, it makes perfect sense to build them into all aspects of design. In short, including patterns into the built environment––especially in the form of natural building materials like reclaimed wood––will optimize the design for the human brain. 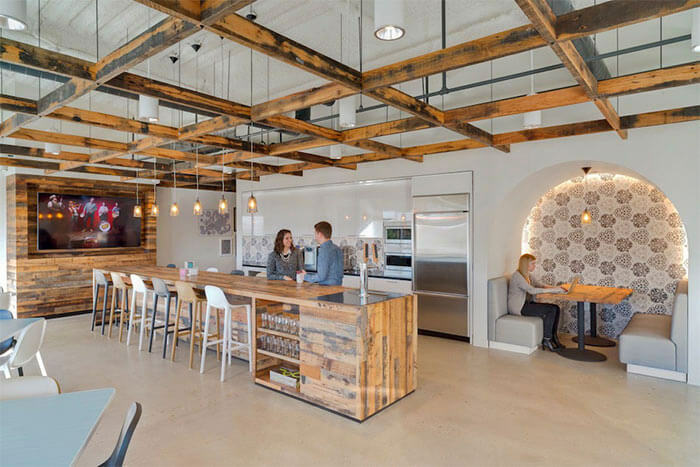 Occupants will be happier, more productive, and enjoy the overall experience more.